Yesterday I discussed the above wonderful Jessica Simpson Mandalaye Elastic Ballet Flats. I first saw them in San Antonio and then purchased online. They are likely the most comfortable shoes I have ever put on my feet. With my new treasures in hand, I wanted to create a layout that would work. I have all of the above item with the exception of the tan off the shoulder top; I am looking. 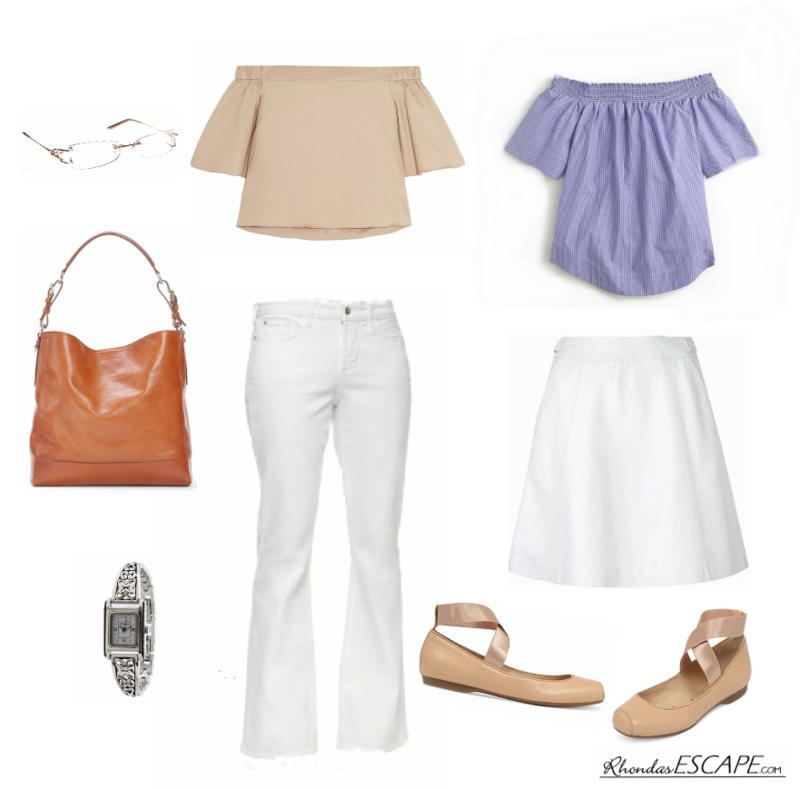 The Lauren white a-line skirt is short, well above the knee and is a summer item I wear a lot. Great for a nautical look with a strip top. The white jeans are Not-My-Daughter's jeans in petite and are also a go-to item for casual summer wear. The Braided Handle Hobo Bag I purchased last week at the Palm Beach Ralph Lauren store. I saw this bag on sale a few weeks back and knew it would make a great replacement for my old travel stripe beach bag. However, even at 2/3 off the original $1950.00 price, out of reach. I have come to know the associates at this store and a few days later I got a call that there was going to be an additional 30% off. Still a lot, but for an investment piece, justifiable. This will become my travel purse, to hold tablet, cell phone, various cables/chargers, headphones and business portfolio. The two other items in the layout are my Fred Eyeglasses and my Brighton watch. Brighton has great accessories, from watches, rings, to necklaces; all reasonable. One of the best travel investment I have made recently is the headphone; Samsung Level Over - noise cancelling. A few flight ago there was a screaming baby the whole flight - A life saver for the baby and myself. Several weeks ago I getting into my seat on an PBI/ATL flight and my seat mate said, "You look so organized." In these days of delays, full flights, and lack of customer support, being organized is a must. Delicate - I like that.